The New York Film Academy is proud to announce a contest for students to pitch ideas that tell the story of the James Webb Space Telescope (JWST). JWST is poised to become one of the most groundbreaking scientific and engineering achievements of our time, designed to operate at near absolute zero, and approximately 1.5 million km away from the Earth. Now, the New York Film Academy‘s students will have the rare opportunity of being a part of the global dialogue and excitement that surrounds the development of the JWST. By creating powerful, engaging, and visually exciting stories featuring the Webb Telescope, students will explore humankind’s most significant scientific marvels first hand, and also have a chance to be featured in NASA’s websites. The initial round of the contest calls for submissions that contain strong self-application essays, reflecting upon the students’ views of JWST and why they should be picked for this highly prestigious opportunity. The second round will begin with invitations for selected students to tour Northrop Grumman and NASA’s Jet Propulsion Laboratory (JPL), two facilities that house some of JWST’s vital components, and where most of the principal photography will take place. These tours will further motivate students for the final round of the contest, which culminates with no less than a live pitch to a committee featuring members from NASA, JPL, and Northrop Grumman! The New York Film Academy continues to lead the educational frontier for innovative STEAM-based education initiatives. Pay close attention as the first products of our collaboration with NASA, Northrop Grumman Corporation, JPL, and others, roll out in the beginning of 2015. Cover letter outlining your interest in the JWST story. Reel or sample of your work. Materials may be submitted by individuals or groups. Selected students will receive a tour of JWST’s facilities and an opportunity to pitch their ideas to a committee including representatives from NASA. Winners will be given equipment and support to shoot a PSA that will be featured on NASA’s website and various other platforms. Contest open to all One Year, Two Year, MFA, BFA, MA and AFA Students in good standing. For more information about the James Webb Telescope, visit jwst.nasa.gov. 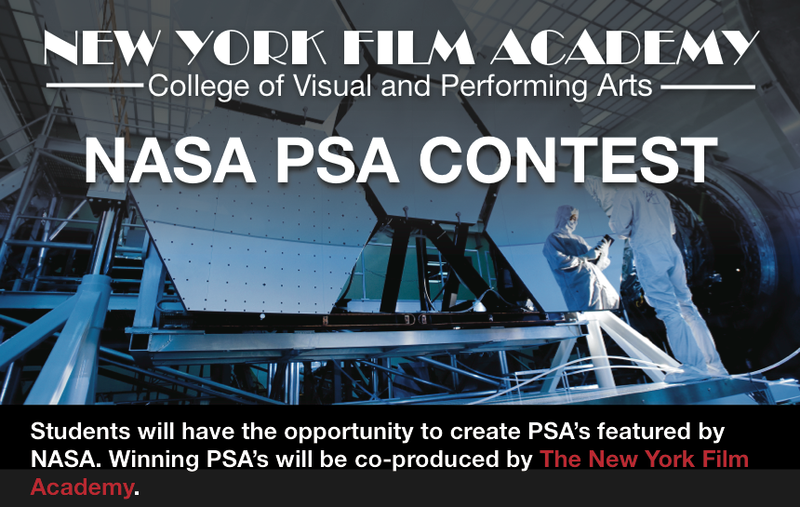 For submissions and/or questions about the contest, please email nasa@nyfa.edu.